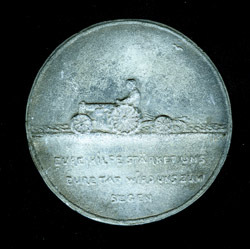 Description: Medal of thanks from Chortitza Mennonites to American Mennonites for relief aid; obverse; see 2007-0083 for reverse (scanned from original medal; see also 2004-0220) The fact that the initials "CEK" appear on it probably means it belonged at one time to Christian E. Krehbiel. 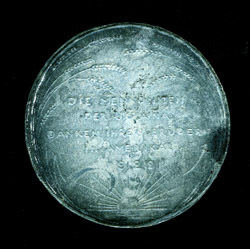 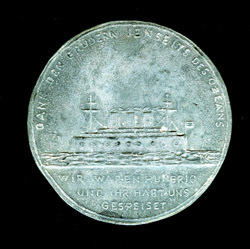 Description: Medal of thanks, presumably from Chortitza Mennonites, to American Mennonites for relief aid; obverse; see 2007-0085 for reverse (scanned from original medal; contrast enhanced) See also 2007-0082. 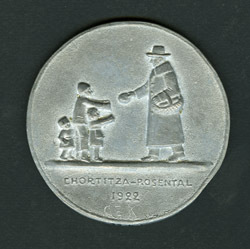 Description: Medal of thanks, presumably from Chortitza Mennonites, to American Mennonites for relief aid; reverse; see 2007-0084 for obverse (scanned from original medal; contrast enhanced) See also 2007-0082.